New Winter 2018: The design of this personalized military ornament is spectacular, featuring a well-armed jet streaking in to fulfill its mission. The U.S. Air Force fighter jet honor of service personalized ornament is a great way to pay homage to those actively serving in the Air Force and to veterans who should be reminded that we appreciate what they did for their country. 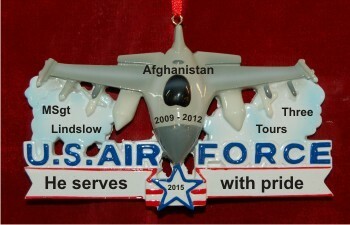 As a personalized Air Force ornament, it includes the information you provide. We’ll paint it on by hand in a handsome font where shown to create a military ornament of lasting sentimental value. The Air Force fighter jet arrives in our exclusive velvet bag as a bonus.